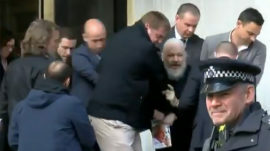 Assange was arrested by London’s Metropolitan Police after Ecuador withdrew his asylum which had allowed him to take refuge in the country’s embassy in the United Kingdom since 2012. A video widely shared on social media showed Assange being dragged out of the embassy into a police van. “We certainly hope that all of his rights will be respected,” Kremlin spokesman Dmitry Peskov was quoted as saying by the state-run RIA Novosti news outlet. “We need to use all international opportunities to protect the person who tried to expose the truth and bring information to the public that some entities carefully concealed,” RIA quoted Chepa as saying. “That’s what will happen to everyone who dares to tell the truth about the dark affairs of the United States,” he wrote on his Facebook page.